Laboratory of Phytoplankton Ecology is a specialized section of the Department of Plankton and Fish Ecology. The department carries out the research on phytoplankton, zooplankton and fish. The research is oriented on the role, the biotic communities play in the food web of reservoirs or lakes including the relationships with physical, chemical and microbial processes and human influences. The department adresses causal questions of quantitative and qualitative occurrence of different organisms in time and space. The emphasis is on biotic interactions (feeding, growth, mortality, predation, production) which facilitate ecological success of reservoir species. Both bottom-up (nutrients-fish) and top-down (fish-nutrients) approaches are followed. Long-term development of phytoplankton, zooplankton and fish during reservoirs ageing are also studied. The department carries out extensive field surveys and a number of defined laboratory experiments. Limited attention is paid to geographical and systematic aspects of biology of water organisms. Digital camera Olympus DP 70. Picoplanktonic cyanobacteria represent small, single-cell photosynthetic organisms of various forms (spherical, rod-like or cylindrical cells) ranging in size from 0,6 to 2 mm. These cells do not contain gas vesicles (aerotops) and consequently are usually freely dispersed in the water column or constitute underwater depth maxima. Picoplanktonic cyanobacteria play pivotal role in marine and oceanic environments by creating the major part of the primary production and the initial step in the food chain. Their occurrence in the freshwater environments is not that significant but they are after all very fateful and intriguing subjects of many studies. The most studied freshwater environments with picocyanobacterial presence are oligotrophic waters, exhibiting limited growth of other cyanobacterial species and algae. These cells can grow solitary or create large colonies or aggregates (up to 200 mm). The most common picocyanobacterial species occurring in solitary forms are Synechococcus, Cyanobium and Synechocystis, colonial forms are represented by Aphanocapsa, Aphanothece and Cyanodictyon. Since 2000 to 2004, quantitative and qualitative analyses of the phytoplankton were performed to determine the amount of cyanobacteria in reservoirs studied. Cyanobacterial bloom was recorded at the most of the reservoirs studied. Colonial cyanobacteria (genus Microcystis, especially M. aeruginosa) dominated during summer as the dominant species of water bloom. Other commonly found cyanobacteria (Woronichinia naegeliana, Microcystis flos-aquae, M. viridis, M. wesenbergii, Anabaena flos-aquae, A. circinalis, A. planctonica, A. crassa, Aphanizomenon flos-aquae, A. klebahnii, A. yezoense) occurred rather subdominantly or prevailed only in few sampled reservoirs. Species composition, biomass and dynamics of the phytoplankton depend on many factors. Besides trophic status of particular reservoir, a seasonal course of weather plays an important role. The excesive growth of cyanobacteria and strong dominance of Microcystis aeruginosa reflected an exceptionally long period of the hot dry weather in 2003. On contrary, lower phytoplankton biomass and high species diversity may be attributed to different course of weather in 2004. The research of planctonic representants of the genus Anabaena specializes mainly in coiled types. Morphological characters of natural populations and strains in culture (liquid medium WC, light cycle 16L:8D) is investigated. Influence of light intensity and temperature on morphology is tested by experiments with cross-table gradients of temperature and light. Influence of turbulency is tested by culturing on orbital shaker. Reversibility of morphological changes is tested by incubation in Pringsheim’s soil-water medium and in dialysis bags in pelagial of the Římov Reservoir. Sequencing of the 16S rRNA gene and the confrontation and discussion of morphological and molecular results is expected. We have isolated, purified and are maintaining a culture collection of planctonic cyanobacteria. 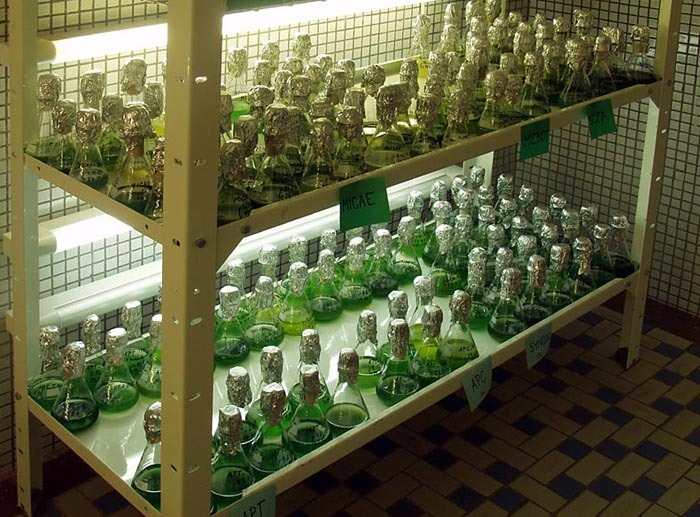 Our collection contains about 200 of mainly bloom forming cyanobacteria (59 strains of Chroococcales, 76 strains of Nostocales and 100 strains of picoplanctonic cyanobacteria). These cyanobacteria serve as model strains to study their phylogeny, physiology and ecology.